Blue Apron is down 50% from its IPO price. 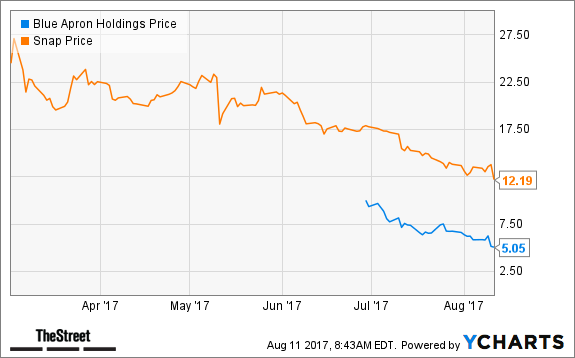 Shares of Blue Apron Holdings Inc. (APRN - Get Report) have had a bumpy ride since going public. Blue Apron stock priced its IPO at $10 per share in late-June. It's 52-week high is $11 and shares have been in a steady downtrend since its public debut. On Thursday, Apron stock tanked 17.63%, making new 52-week lows just above the psychologically important $5 level. This came following the company's disappointing earnings report. In midday Friday trading, shares were at $5.08, down 1.2%. Snap Inc (SNAP - Get Report) , another recent IPO, at least saw its stock trade significantly higher following its public debut. At least temporarily. That matters little now, given that shares have tanked 40% in three months and were down another 14% in early trading Friday following a top and bottom line earnings miss. Although, there was one positive. Back to Blue Apron. The company missed on earnings per share estimates, but beat revenue expectations. Still, frustrations are mounting as costs rise, profitability evades and as the stock price sinks. Add in the fact that Amazon.com Inc. (AMZN - Get Report) is entering the food/meal-delivery space after its Whole Foods Market (WFM acquisition and investors have a right to be downbeat. While Blue Apron closed at $5.14 Thursday, it was dropping again in Friday's trading session. Some wonder, though, could a low (or dare we say bottom) be near? Analysts at SunTrust and Citigroup both downgraded the stock to hold/neutral and assigned a $5.50 price target. The price target actually implies about 10% upside from current levels, which makes us wonder if perhaps the stock's 50% haircut over the last month is excessive. Apron stock now sports a sub-$1 billion market cap as of Thursday's close. Analysts at Oppenheimer also downgraded to neutral. Analysts at Goldman Sachs noted that they were "clearly wrong" about Blue Apron and as a result, downgraded the stock to neutral while assigning a $6 price target. So yes, it is too early to call a bottom in APRN stock, as tempting as it may be. But such a rapid decline in a short span, followed by an influx of downgrades with price targets above the current price is encouraging.